The savory smells of meatballs and mac and cheese filled the air as Michaela Nielsen found the end of a line of people. 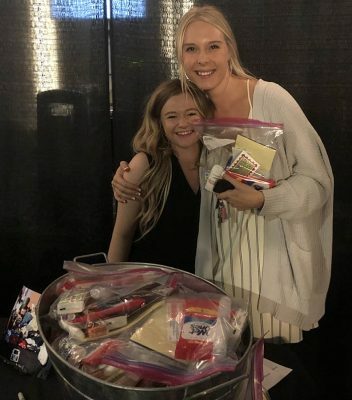 As she moved forward she saw baskets of toothbrushes, wet wipes, lip balm, lotion, crackers, pens and paper — the elements of blessing bags for the homeless, an outreach that added to the splendor of the Hanging of the Greens event Wednesday night at Grand Canyon University Arena. 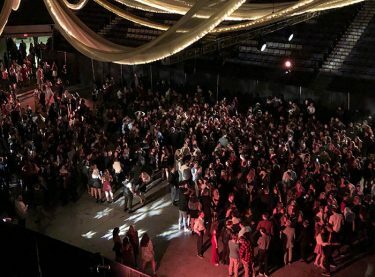 More than 3,000 students turned out for the winter formal, featuring dining, dancing, crafting snow globes, savoring GCBC hot chocolate in four flavors, and letter writing to home with postage paid by the Canyon Activities Board (CAB), and notes to the homeless for the Can You Spare a Story initiative. Sydney Grover, (right), founder of Can You Spare a Story, helps fellow students write notes to the homeless and fill blessing bags. The senior from Omaha, Neb., took a break from final exam preparations to dress up and take photos in front of Christmas trees inside and outside of the arena. 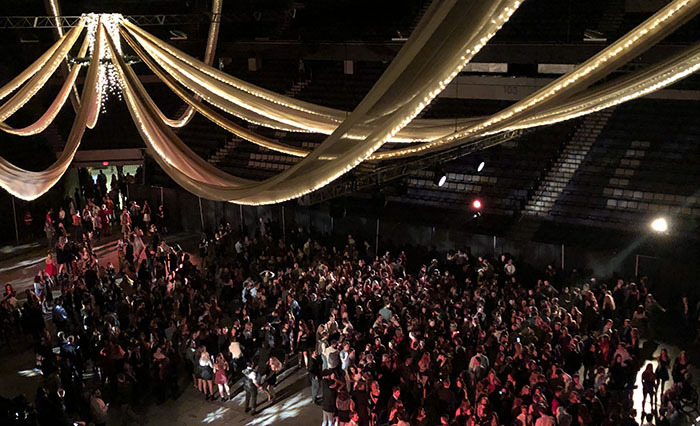 “In this finals time it is nice for people to come together, and then to have this little surprise where you knew you could give back — and it was zero effort — that made it really special,’’ she said. Sydney Grover gets a hug from Michaela Nielsen, who wrote a heartfelt note and filled a blessing bag for a homeless person. After depositing her blessing bag in a stack that exceeded 100, Nielsen offered a hug to organizer Sydney Grover, who founded the nonprofit organization Can You Spare a Story in 2017. The junior from Las Vegas, who will graduate early, next April, interviews homeless people and shares their stories and photos on her website. “We want to change the stigma of the homeless, especially with the younger generation,’’ she said. The blessing bags will be distributed on Dec. 22 at the intersection of S. 11th Avenue and W. Jefferson Street. 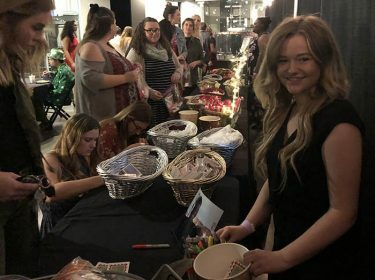 Her organization, which includes several dozen GCU student volunteers, also provides clothing and haircuts for the homeless. Its six-person board of directors includes Colangelo College of Business adjunct faculty member David Soto. “People are writing Bible verses, words of encouragement. ‘You are loved’ is constantly heard,’’ Grover said. Seniors Stephanie Fairchild and Jordan Brillantes enjoyed dressing up for Hanging of the Greens. 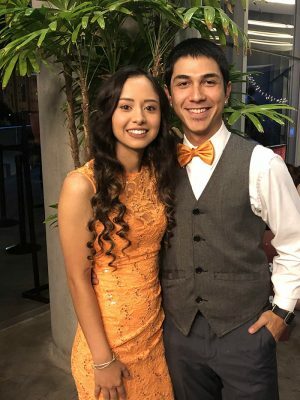 Stephanie Fairchild wrote a note and filled a blessing bag along with her color-coordinated date, fellow senior Jordan Brillantes, whose gold bow tie matched her dress. The event was spearheaded by students, led by CAB Director of Special Events Kenzie Hayes and Assistant Director Ryan Nguyen. Seven members of Hayes’ team worked the event along with 16 other CAB members who volunteered under the guidance of Student Engagement Coordinator Scott Kolmer. 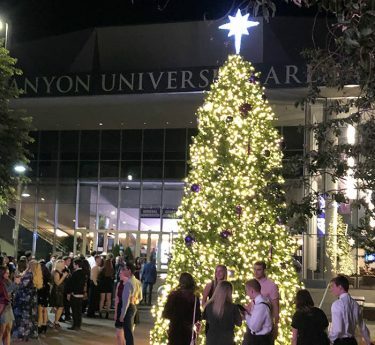 Students posed by the Christmas tree as they awaited the opening of GCU Arena. The CAB team hired GCU alum Brandon Yamaguchi as the disc jockey to mix danceable songs with Christmas music. Kalea Culligan expertly moved to the beat of the Christmas music. Her date, Jake Bradshaw, enjoyed the Christmas decorations and wore festive, formal attire. Yet Bradshaw’s movements on the dance floor were nearly limited to talking to friends — that is, until “Tremor’’ and “Party till we die’’ blared from the speakers. Barely suppressing his role as Co-President of the Havocs, Bradshaw rocked the dance floor for those tunes. The familiar songs, pre-game Havocs staples, further electrified the energized crowd. The dance floor filled up quickly for the Hanging of the Greens.